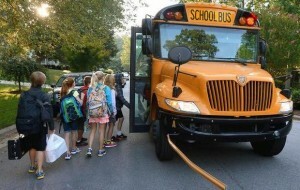 Now that the school year is in full swing, drivers need to be consistently conscientious that they are sharing the road with school buses. Young students also need to be aware of how to safely get to and from school using the bus. It’s a two way street, and the safety of children is the foremost concern. The National Highway Traffic Safety Administration outlines some important guidelines below for students and drivers alike. Parents, explain to your child the importance of obeying these safety tips. Drivers, always keep these tips in mind when operating a vehicle around a bus full of schoolchildren. Also, remember the law (described below) regulating these activities. Disobeying the law will not only warrant you a steep penalty, but will more importantly cause you to risk the safety on of young children. • Obey the law: Under North Carolina law, G.S. 20-217, drivers going either direction must stop when a school bus is stopped to let children off. Drivers are not supposed to continue until the bus has completed dropping the children off and begun to move again. • Be alert. Children arriving late for the bus may dart into the street with out looking for traffic. o Red flashing lights and extended stop arms indicate that the bus has stopped, and that children are getting on or off. Motorists must stop their cars and wait until the red lights stop flashing, the extended stop sign is withdrawn, and the bus begins moving before they can start driving again. • Use the handrails to avoid falls. When exiting the bus, be careful that clothing with drawstrings, and book bags with straps don’t get caught in the handrails or doors.